Suitable for experienced and general level students. Many of us come repeatedly to our mats to practice daily, weekly, monthly, yearly. Why? And for what outcome? On the mat, when we position ourselves within a pose, we create a bodily frame from which to relate our experience. Initially we focus on attending to all the ‘actions’ that make up this experience – the lines, the shapes, the movements, the holds, the subtle nuances. All this requires great will power. However, it is what happens next, when the ‘action’ is established, that changes us, transforms us, informs us and ultimately brings forth the ‘intelligence’ referred to by Guruji. 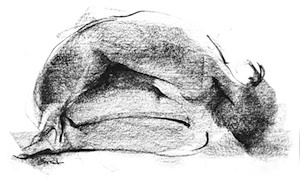 What happens when the dog pose is done? The shape is achieved? There is a subtle moment between night ceasing and dawn breaking when the temperature drops, a pivotal moment between night and day. Likewise there is a pivotal moment between “action” and “reflection” in the practice of a pose. It is also subtle and easily overlooked or overridden by the dominance of movement. We must learn to be alert to this moment, to recognised, to capture it. Then we start to listen, to observe, to tune our ear to our mind’s response to the experience. Conscious action within the pose. To be present and self-aware at this point is critical if our practice is to mature from movement to action with intelligence. In this state of awareness, a space within us is opened up. We are then able to take on the role of witness, to observe what arises in the mind at this point, to become aware of habitual patterns and responses. What we are doing is evolving a feed- back system from body to mind, mind to body. Our actions then become infused with awareness, and discernment becomes the by-product. Intelligence is born! Practice then becomes a dynamic and transformational state of awareness where listening and action have equal status. Lulu will be conducting a weekend workshop at the Armidale Yoga Studio for experienced beginners & general level students. Lulu will be conducting a 2 day workshop at the Tanja Hall, Tanja, near Bega. Please note that bookings are essential, and full payment is required by September 30. Lulu will be conducting a weekend workshopat Yarraville Yoga for general and experienced level students. Lulu will be holding her annual residential retreat at Sangsurya Retreat Centre. The 5 day retreat commences Friday 5pm and finishes Wednesday 1pm. Suitable for general/experienced students. This retreat is very popular so book early. FULL PAYMENT IS REQUIRED BY TUESDAY JULY 14. *Non-refundable deposit on booking. Please note that accommodation is twin or triple share. The retreat centre has a limited number of private rooms available at an extra cost (Contact Vicki for pricing). Please be aware that as the private rooms are limited, we take bookings on a first-come-first-served basis. Lulu will be conducting a weekend workshop at OM Yoga (Adelaide CBD) for general and experienced students. Please note there will be an extra session on Friday June 14th (evening) for teachers and trainees. Lulu will be conducting two weekend wokshops at the Blue Mountains Iyengar Yoga studio in 2019. These weekends are designed for teachers who are interested in deepening their practice and teaching, through the study of the Junior Intermediate syllabus, and for those teachers wishing to progress towards Junior Intermediate assessment. The weekends will be structured around Junior Intermediate Level 1, 2 & 3 syllabus. The weekends will focus on practice, and how the understanding of the postures carry through to teaching for this level. We will draw from postures in the Introductory 2 / Junior Intermediate 1, 2 & 3 syllabus. Those attending should be well prepared by downloading the relevant syllabus (JI 1, 2, 3 packs) from the Association website and should have some knowledge of the poses prior to the weekends. *this content may vary according to need. Limited places available. Please book early to avaoid disappointment. CLICK HERE to download registration form. For other events, please contact respective schools. Deposits are non-refundable—please book well in advance.